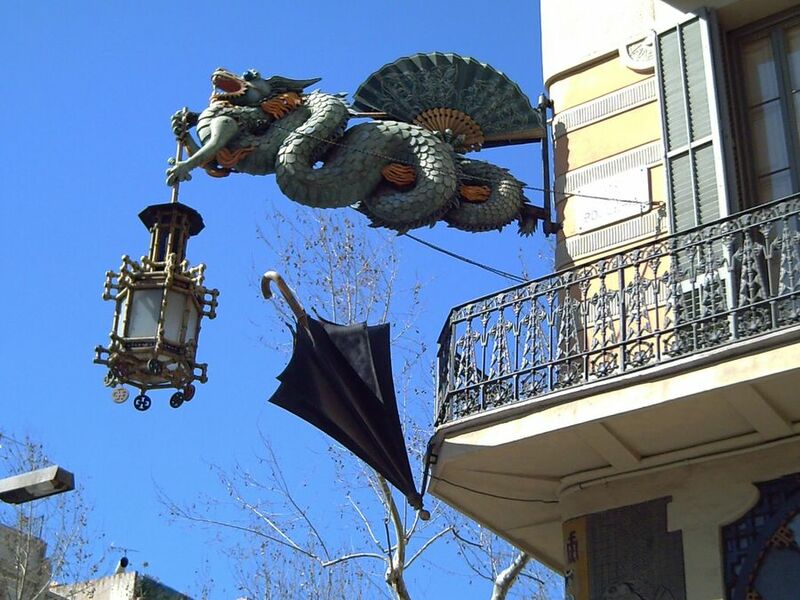 Just in front of La Boqueria market and very close to the opera house El Liceu, on the façade of one of the art deco style buildings you find this magnificent dragon holding an enormous lamp in menacing attitude as if guarding the old umbrella shop shut down a long time ago. Besides the oversized fan on top, a curious umbrella keeps floating in the air as the reminder of old prosperous times for this trade. Great photo. Odd that both you and Bob of Barcelona chose lamps today for your blog! That's an interesting combination. I wonder, was it an asian umbrella shop? >Yes Luggi, you are right. After your comment I took a look at Bob's picture. Oddly enough we both dealt with similar topics. Luckily it was not the same lamp. >Sorry I don´t know at the present moment if the shop was Asian. Though it is an interesting question. I kept wondering about the significance of that umbrella for a while (I usually look at the photo before reading the text). Thanks Manuel for noticing the ambiguity of the umbrella in the picture. Interesting observation!